Several friends have asked me to tell about what a normal Sabbath is like in our home, so I am doing that in two parts. Last time I shared what we do on Fridays, so now let’s talk about what we do on Saturdays. The most basic principle of Sabbath is that we are to rest. However, in our family, we have decided that there is more to rest than just sleeping in a little later, not cooking, and avoiding working our jobs. 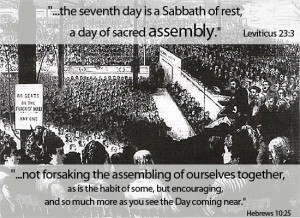 A very important aspect of Sabbath is making it “a day of sacred assembly.” In fact, we have found that meeting with other believers once a week is extremely important to feeling rested by the end of Sabbath. I realize that many of you don’t know any other people who rest on Sabbath, so you might not have anyone to assemble with. Others cannot find a fellowship with which they agree doctrinally. If this is your situation, you might want to read a series of blog posts I wrote a few years ago about the church. However, the ideal situation is to assemble with others. “So Messiah himself gave the apostles, the prophets, the evangelists, the pastors and teachers, to equip his people for works of service, so that the body of Messiah may be built up until we all reach unity in the faith and in the knowledge of the Son of God and become mature, attaining to the whole measure of the fullness of Messiah. Then we will no longer be infants, tossed back and forth by the waves, and blown here and there by every wind of teaching and by the cunning and craftiness of people in their deceitful scheming. Instead, speaking the truth in love, we will grow to become in every respect the mature body of him who is the head, that is, Messiah. From him the whole body, joined and held together by every supporting ligament, grows and builds itself up in love, as each part does its work” (Ephesians 4:11-16). We need prophets, evangelists, pastors and teachers. So that we will be equipped for works of service. So that the Body of believers in Yeshua will be built up. So that we will reach unity in the faith and in knowledge. So that we will become mature. So that we won’t be deceived (as infants, tossed by the waves, blown here and there by every wind of doctrine). Have you ever noticed any of these problems among believers? 🙂 I have, too! Scripture says these problems won’t happen when the Body is functioning correctly. Scripture teaches that this is a local body, not the worldwide body of believers. In other words, listening to teachings on the Internet is NOT the same thing as assembling with believers on the Sabbath day. Titus 2:1-15 tells us that younger men need older men, younger women need older women, and so on. In other words, we need to brush up against the humanity and problems of people, so that we learn how to interact properly with others and so that we grow up and mature in our ability to love others. “Let us consider how we may spur one another on toward love and good deeds, not giving up meeting together, as some are in the habit of doing, but encouraging one another—and all the more as you see the Day approaching” (Hebrews 10:24-25). We can look at the book of 1 Corinthians for a manual on how to behave when we assemble together. Chapter 14 is especially appropriate, so be sure to read it. “When you come together, each of you has a hymn, or a word of instruction, a revelation, a tongue or an interpretation. Everything must be done so that the church may be built up” (1 Corinthians 14:26). So this is what we do on Saturday. We sleep in a little bit longer, then we have breakfast which we prepared ahead of time. We start with music and prayers. My husband gives a short teaching on that week’s Torah portion. By then it’s lunchtime, so we all share our food together. After lunch, we have another short prayer time and recite some traditional blessings together. The kids go into the next-door room to play while we grownups sit and talk Scripture and life. It’s awesome. I highly recommend it. So is the loading up of food, equipment and such considered work on the sabbath? Just wondering as we do all of this as well, only on Sundays. You know, I’m not sure. I think the general idea is, if we CAN do it ahead of time, we should, so that our bodies can get as much rest as possible on Sabbath. On the other hand, much of what pastors and elders do on Sabbath IS work (teaching, loading up equipment, setting up and taking down chairs, etc.). I think about the priests. Yeshua said, “Or have you not read in the law that on the Sabbath the priests in the temple profane the Sabbath, and are blameless?” (Matthew 12:5). Sacrificing (butchering) animals and caring for the Tabernacle, as well as teaching the people, leading the singing — all of these are hard work! Of course, they had a rotation schedule, and they only worked from ages 30-50. Some of these things don’t work right in this time period, while Israel is dispersed from the Promised Land. But we try to do the best we can, right? Wouldn’t the use of electricity be considered as ignition of fire? or driving your car? Thank you in advance for your answer.